I’ve already decided I have too many tags. Since I’m planning on re-shelving my books in tag groupings to make them easier to find, I would put the one book about telescopes with all the astronomy books. I’d probably also shelve the six books on robots with the eleven books on AI, and eliminate humor and poetry as tags because I just don’t have enough books on those topics to justify a tag. I could convert Humor to Memoir and start beefing up that category. See, there’s lots to think about when playing home librarian. If all I had was science fiction, I’d just alphabetize my shelves by author. The fun thing about this work is realizing the reality behind it. I have 705 physical books on four bookshelves at home and one at work. Then I have all those books vaguely shelved in my mind. To be honest, I can only remember a small fraction of my books at any one time. And when I do remember a book I want, it’s very hard to find the physical copy. I’m using LibraryThing to aid my brain in understanding my library of 705 books – to help remember all my titles, and hopefully create a system to quickly find the physical volume. In other words, I have books, a brain and a database. The LibraryThing is only a list making tool. By adding Xmind, I’m adding a visual modeling tool into the mix. Science shows us that our brains can only handle so many objects in our conscious minds at once. Seven things is where we max out, and even holding seven things in the mind is hard. Xmind allows me to go beyond the seven limit and visually map out more items on my computer screen, but even mind mapping has limits. I can’t mind map a 1,000 objects. I haven’t learned it’s limit, but I’d guess it’s less than 100 items, and maybe less than 50. Think of it this way: How many aspects of reality do you specialize in studying? I have 35 books on space exploration. I’m no expert, far from it. But it’s a topic I like. I have 47 books on programming, most of which are on languages I’m forgetting because I’m switching to new ones. I am a ASP programmer. I’m becoming a PHP programmer. The better I get at PHP the more I will forget ASP. We can only keep up with a limited number of topics in life, and the books I’ve bought reflect those topics. 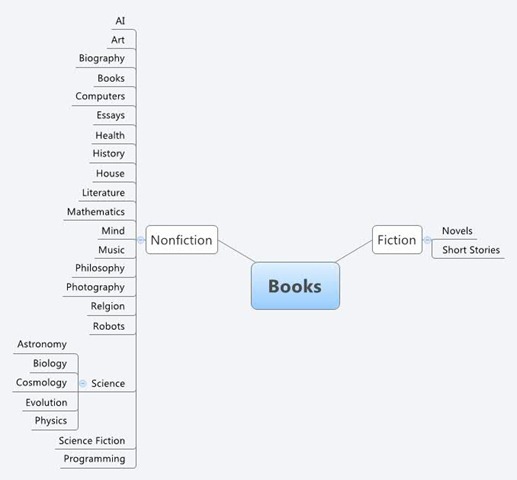 I plan to use LibraryThing and Xmind to refine my focus and help me zero in on the topics I want to study the most. I already spotted topics in my collection that I’m considering abandoning, like Kerouac and Wyatt Earp, and new topics I want to pursue, like cosmology and mapping the universe. Under the new system I’ll tag topics I want to pursue. (And it’s logical that I’d shelve books on each of those topics together.) I created a new mind map based just on topics, and not levels of organization like nonfiction, science, astronomy, cosmology. I still have too many topics to pursue, but things become clearer. Under my old system I tagged any book, fiction or nonfiction related to science fiction with a tag for SciFi, and since I have a whole lot of books by and about Robert A. Heinlein, I had a tag for Heinlein too. So one of his novels could get tagged: Fiction, Novel, SciFi, Heinlein. With such tagging I could create lists of all my fictional books, all my novels, all fiction and nonfiction books related to science fiction and any book with a Heinlein connection. Under the simplified system this won’t work anymore. A tag of Heinlein would mean any book about Heinlein. If I wanted a list of books by Heinlein I could search by author. A SciFi tag means books about science fiction. 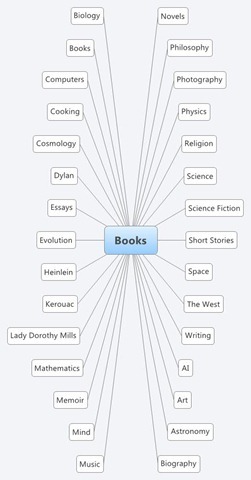 I’d have no way of listing all my science fiction novels and short story collections separate from general fiction – that is just by using the Tag concept in LibraryThing. However, LibraryThing also has the Collection object. I could create Fiction and Nonfiction collections, and then my tags would only apply to those books. Under the Fiction collection, I could have novels about cosmology and AI. This offers a lot of flexibility and new insights on how to organize my books both physically and mentally. But how do I model this in Xmind? And are the distinctions Fiction and Nonfiction really important? Take Jack Kerouac. He wrote novels. He was a character in many novels. And whole libraries have been written about his books, his life, and his characterizations, and the people around him and their characterizations. I could change my topic label from Kerouac to The Beats and be more accurate about my interests. What about science fiction? Is it science or fiction? Actually my interest in science fiction can reflected in more specific tags: AI & Robots, Space Colonization, Homo Sapiens 2.0, Mars, The Moon and Intelligent Life. But how do I categorize the Mars of Edgar Rice Burroughs versus Kim Stanley Robinson versus NASA? Do I make categories: Real Mars and Fantasy Mars? They are two separate topics about reality, what we know about the real planet Mars, and what we know about all the fantasies about the imaginary planet Mars. This opens up a whole new way of thinking, a whole new way to attack the problem, and more important than that, a whole new way of living. What are my core topics? Can I mind map them? Could you make a list of all the subjects you care about the most? Ones you could feel like a semi-expert in a discussion. This project will take me awhile, so I can’t produce my final list for this post. But I think I’m on to something. Instead of flitting from one topic to the next and accidently collecting books, I need to decide what topics I want to specialize in studying, and build my library to support those interests. I admire both the rigor and the science-minded approach you are bringing to your collection of books. For me, the only book in question is the book I’m reading. All the others are objects extended in space, somewhere. True, time is often lost in the search for this or that book, but on the way to finding it I more often than not unearth something long forgotten. Adopting your system would, in effect, become a “closed” vs an “open stack” library system. I still cherish open stacks. I’m always going to read books in a higgly-piggly fashion. I’m only regidly planning part of my reading. So my library will always represent two ideals, chaos and order. Serendipity is too good not to rely on for most of my reading. It may well blow your mind ! But is The Brain worth the $249 for the personal edition? Next Next post: Can You Call Yourself an Expert in Any Subject?